Welcome to a birthday celebration fit for a king… well, in this case, a splendid party fit for a 1 year old prince named Riley. 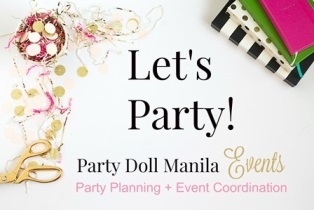 Doing what they do best – masterful planning and execution, Party Doll Manila Events, along with Sweet Nest Events gave Riley a grand celebration indeed! Check out these great shots by Jed Uy Photography. Guests were ushered through a Romanesque round arch in royal colors of ivory white and blue, and ornate details in gold – an indication of a royally spectacular celebration. Reminiscent of royal castles and their baroque ceilings and walls, Riley’s party hall had yards upon yards of royal blue, cream and white swags for a canopy. The royal details on the ceiling included a seemingly endless string of blue balloons that mimicked strings of sapphire and moonstone, glittering diamonds, gold crowns and other gems that came together very nicely for that “royal feel”. Set up with elaborate pomp, the stage resembled a monarch’s raised throne under a canopy and arches. An adorable Riley bear sat comfortably on the usually over-sized, ornately designed royal chair, just chilling and watching as everyone enjoyed the party. As if touched by the legendary King Midas, all the chairs and tables were gold! And on each table was a “beary” royal centerpiece with a charming prince Riley bear, wearing a gold crown and royal blue cape. Riley’s birthday cake must have surely drawn in the crowds! It was a three-layered cake also in the royal colors of ivory white, blue and gold. It was flawlessly decorated – from the smooth finish of the fondant, the embossed or quilt effect, the intricate fondant lace painted with edible gold dust up to the adorable bear topper. If a cake can be described as majestic, then Riley’s cake sure is one! Riley’s court did not have the usual jester but the entertainment was even better! Everyone smiled and roared in laughter. In addition to the catered food, guests enjoyed other tummy fillers like hotdogs, nachos and fries from food carts strategically stationed at the party venue. It was indeed, a party to remember. Riley had awesome giveaways from bear pillows, and personalized key chains. Each of his godparents brought home a royal pillow with Riley’s monogram in it. Riley and his parents – a picture of joy and family love during his birthday. One can only prosper and mirror contentment in a family such as this.